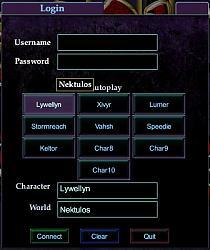 This patch for Zonx' Fetish Nightfall adds buttons to the login screen to fill in the Character Name and Server for you. There are ten buttons (since one account can have up to ten characters) that you can modify. The username field is filled in with the last username you used. You can hardcode both the password and an initial server in the file. Look for the entry "P A S S W O R D" and replace it with your password and "S E R V E R" with your preferred server name. A small number of lines below those entries is the button list (hugely taken and modified from Mook's login code). Simply replace the LocalText "CharX" with the character name, and the LocalTooltip "ServerX" with the server that character resides. Leave any extra buttons alone. WARNING: Having a hardcoded password in this file is potentially dangerous if anyone else has access to your computer! 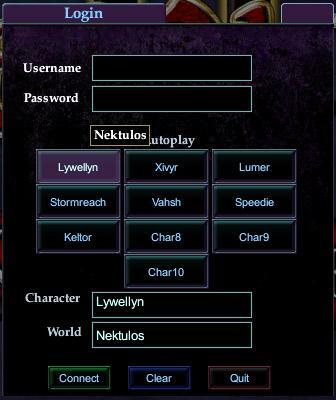 The blue "Clear" button clears both the character and server entries if you wish to login to the character creation screen. Very important! You must access the game with the EverQuest2.exe file and NOT the EQ2.exe file! Using the patcher will completely bypass this login, so using the EverQuest2.exe file to run the game will show you the login window to use. You can find the EverQuest2.exe file in the same directory as the EQ2.exe file, normally C:\Program Files\Sony\Everquest II\. Yes, I realise this is a somewhat older mod - still, another great idea and 5 seconds saved with each login. Those add up! Would it be at all possible to incorporate more than one account?